Honolulu, Hawaii. 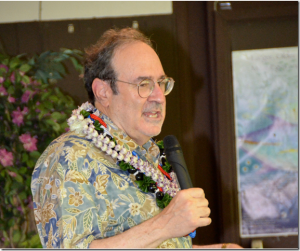 Eric Saul, historian and curator, in a major speech to Military Intelligence Service (MIS) Veterans Club of Hawaii and their families at the Tree Tops Restaurant in Manoa, located on the outskirts of Honolulu, on August 4, 2013, told his audience “So after 70 years, . . .you have earned your place in the Pantheon of American history for your contributions to democracy.” Other attendees included the 100th Infantry Battalion, 442nd Regimental Combat Team, 1399th Engineer Battalion veterans and their families and friends. Saul visited Hawaii to collect photographs, writings and oral histories of veterans for use in future exhibits. Like most people from Europe, your parents came to America to seek economic opportunities. By 1900 there were 60,000 Japanese immigrants in Hawaii and 24,000 on the mainland, mostly in California. Today there are over 700,000 Japanese Americans and they represent one half of one percent of the U.S. population. They were denied constitutional rights to become citizens and to own land. Many local, state and Federal laws were passed, excluding them from the opportunities enjoyed by other new immigrants. Your parents spoke Japanese. They wanted you to speak Japanese and to retain your special heritage, and they sent you to Japanese language schools. Most of you didn’t like it. You wanted to fit in, become Americans. Yet, in Japanese language schools and at home, you were taught invaluable principles of hard work, honesty, loyalty, endurance and pride. You were taught the cardinal virtues and ethics. You took to heart the concepts of giri…sense of duty, on…debt of gratitude, gamman…quiet endurance, gambari…perseverance, kansha…gratitude, chugi…loyalty, enryo…humility, sekinin…responsibility, haji…shame, hokori…pride, meiyo…honor, gisei…sacrifice, oyakoko…love of the family, kodomo no tame ni…for the sake of the children, shojiki…honesty, otagai…reciprocity, shinsetsu…kindness, shikataganai …it can’t be helped, resignation, okagesama de…all is owed to you, kuni no tame…give your all for the country, kamei ni kizu tsukena…never bring shame on the family, shimbo shite seiko suru…patient endurance brings success. These Japanese values served you well. They helped you endure the adversities of your wartime experience. They taught you to look on the bright side, remain optimistic, and keep your faith. They encouraged you to honor your country and its principles. Your parents saw education for you as the chief tool for your success in America. Yet, despite this unwarranted treatment, your resolve and faith in the United States never wavered. From the internment camps and other areas, thousands of you Nisei volunteered for wartime service in order to prove your loyalty. 16,000 of you served in the 100th Infantry Battalion and the 442nd Regimental Combat Team, which were segregated units and fought in eight campaigns in Italy, France and Germany. Over 800 Nisei men died in line of duty. At the end of the War the Army announced that the 442nd was one of the most highly decorated units during WW II for size and period of combat. In the Asia Pacific Theater, you in the Military Intelligence Service were translators of captured enemy documents, interrogators of enemy POWs and persuaders of enemy surrender; you were superbly effective. Nisei participated in the translation of the enemy’s Z-Plan, the Imperial Navy’s strategy for defending the Marianas Islands against the U.S. Navy. The enemy air and naval capability was destroyed in this campaign and gave American bombers the land base to bomb Japan. From the frozen tundra of Attu, to the coral atolls of the Pacific, the jungles of New Guinea, the Philippines and Burma, the lava terrain of Iwo Jima and the bloodied escarpments of Okinawa, you Nisei collected and processed intelligence information. In Saipan, Iwo Jima and Okinawa you Nisei entered caves to encourage Japanese soldiers and civilians to surrender. Courageous Nisei linguists like Herbert Yanamura, Takejiro Higa and Shoichi Kubo come to mind. When the war ended in August of 1945, your work was not over, for now you were needed to bridge the language gap in the Allied Occupation of Japan. While you fought tirelessly to defeat Japan during the war you now worked equally tirelessly to rebuild Japan as an industrial power. 3,000 additional linguists would join you serving from the lowest administrative level to the national level. So here we are, more than 70 years since you Nisei soldiers entered World War II. Can we now assess the success, not only on the battlefields, but also in your communities? You have proved your loyalty on the battlefields of Europe and the Pacific. Nine American presidents have attested to your loyalty. They were Presidents Franklin D. Roosevelt, Harry S. Truman, Dwight D. Eisenhower, Robert F. Kennedy, Jimmy Carter, Ronald Reagan, George H. W. Bush, Bill Clinton, George W. Bush and Barack Obama. Over 500 discriminatory laws have been repealed. In 1952 your parents could become citizens, vote, own land, become fully enfranchised citizens. This was also the year Spark Matsunaga, Daniel Inouye and George Ariyoshi were elected to the Hawai’i Territorial Legislature. In 1959, Hawai’i became a state. Matsunaga served in the Senate from 1977 to 1990 and fought tirelessly for civil rights for all Americans. We remember Dan Inouye, who served in the Senate from 1963 to 2012 and was the second longest serving Senator and third in line of succession to the Presidency of the United States. He recently passed away and was accorded the honor of lying in state in the U.S. capitol. This wouldn’t have been possible without your wartime service. We honor Norman Mineta who, in part because of the Nisei legacy, could be a mayor of a major American city, serve in Congress, and become a Cabinet officer. From 1987 to 2003, the National Museum of American History of the Smithsonian Institution, held an exhibit examining the Japanese American soldier and the Japanese American community through the perspective of the violation of the US Constitution. The exhibit was entitled, “A More Perfect Union: Japanese Americans and the U.S. Constitution.” In 1988, Congress passed the Civil Liberties Act of 1988, which officially apologized for the internment. When President Reagan signed the bill into law, he recalled in a White House ceremony how he had honored the memory of Sergeant Kazuo Masuda, a 442nd soldier killed in Italy, by presenting the Distinguished Service Cross to his mother and sister in 1946. At that time, he had given an eloquent speech, “blood that has soaked into the sands of a beach is all of one color. America stands unique in the world, the only country not founded on race, but a way, an ideal.” The apology by Congress is unprecedented in American—and perhaps even world—history. In 2000 the US Army conducted, as the result of US Senator Daniel Akaka’s legislative intervention, a review of Distinguished Service Cross awarded to Asian Americans and 22 DSCs were upgraded to Medals of Honor. President Clinton, who pinned the medals on the surviving Nisei and their families, said: “Nisei, in the face of painful prejudice, helped to define America at its best.” He also said, “It’s long past time to break the silence about their courage…. Rarely has a nation been so well-served by a people it has so ill-treated.” That same year, a monument to Japanese American patriotism was dedicated in Washington, DC, near the US Capitol as a national reminder that what happened to one ethnic group must never happen again.. Also in that year, the MIS received its long-overdue Presidential Unit Citation. One of the most remarkable legacies came after September 11, 2001. I remember clearly watching the news when President George Bush, standing alongside his Secretary of Transportation, Norman Mineta, assuaged the fears of Arab Americans by saying that we are not going to repeat the mistakes of the past, and that Arab Americans had nothing to fear from their country. In 2010, the Congress of the United States awarded its highest medal, the Congressional Gold Medal, to you Nisei soldiers of World War II. The Japanese American story speaks of the Greatness of America. God Bless the USA.